The smallmouth bass (Micropterus dolomieu) and the largemouth bass (Micropterus salmoides) are both fish species from the genus Micropterus, and while they do definitely share some things in common, such as green coloration, they also have some differences, as well. The differences between the smallmouth and largemouth game fish varieties include habitat preferences and some key physical features. Fully mature smallmouth bass typically grow to between 12 and 15 inches in length, according to the Ohio Department of Natural Resources. In extreme cases, they can even grow to as long as 2 feet. The average weight range is between 1 and 2 pounds, although, very rarely, they can be as heavy as 10 pounds. 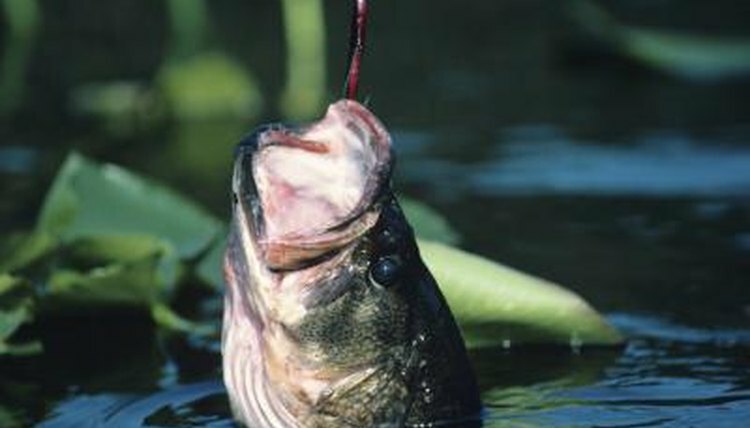 Adult longmouth bass are slightly larger than smallmouth bass. Their general length range is usually between 15 and 18 inches. Exceptionally long longmouth bass specimens can be as lengthy as 26 inches. The average weight range is 1 to 5 pounds, though some can grow to a quite hefty 13 pounds. Subtle size differences are by no means the only things that separate these two types of fish from each other. One quick way to discern the difference is by looking at both of the fish while their mouths are shut. If the mouth goes as far back as beyond the eye region, you're looking at a largemouth. Smallmouth bass, as their names indicate, have smaller mouths that usually only go as far back as the center portion of the eye. Another prominent difference between the smallmouth and largemouth bass species involves striping. The edge of the largemouth bass physique displays a noticeable long black stripe that smallmouth bass fish simply do not have. Just like the largemouth bass, the spotted bass (Micropterus punctulatus) also has this physical feature. Smallmouth bass fish gravitate toward water with some movement -- think rivers, creeks and streams that flow swiftly and have ample boulders and stones. Largemouth bass fish, on the other hand, usually are drawn to waters that are significantly calmer in nature -- think ponds, lakes and reservoirs. Largemouth bass also like their H20 a little warmer than smallmouth bass. They also appreciate places with lots of cover, such as vegetation and logs.